I've been watching the wireless earbuds market for the past couple years, but I had been hesitate to buy anything so far. When Apple announced their new AirPods in October of last year, I was initially intrigued, but still not sure if I wanted/needed them enough to warrant spending $169. Apple had some initial manufacturing delays, and as a result the AirPods did not start shipping until December. This was nice because it gave me ample time to read many different reviews from the mainstream media who had early access to them. Apple AirPods 1 and charging case on an iPhone 7 Plus Jet Black. Apple was not the first to market with wireless earbuds. they are rarely the first to market, but as is usually the case, their wireless earbuds were instantly both popular—waiting time for shipments were 4-6 weeks for the first 6 months after release, and controversial with many mocking their simple design. But hey, it wouldn’t be an Apple product without a little controversy right? Apple AirPods 1 and charging case. I have now owned the AirPods for about 4 months, and I use them on a daily basis. Battery has been fantastic—I have yet to run out of battery power, but I tend to listen for no more than 1-3 hours at a time. One feature I was not expecting is the ability to use only one AirPod which is perfect for listening to podcast at work while still being aware of activity around you. I also use this method while driving which is perfect for safe, hands-free phone use—although I must admit that I have always disliked those bluetooth, one-ear headphones that some use while walking around in the grocery store talking to themselves, so the irony that I have become "one of those people" is not lost on me. Love the small sleak design of both the AirpPods and the small pockable charging case. Long lasting battery at 4-5 hours. Setup was a breeze and in usual Apple fashion even entertaining to watch. Built-in sensors automaticly stop your audio when you remove one of the AirPods, and then start playing again when you put them back in your ear. Built-in sensors automaticly power the AirPods on when you put them in your ear, and power off when you take them out of your ear. This really helps conserve battery power. Ability to get 3 hours of charge from the charging case in 15 minutes. Charging case has an additional 24 hours of charge. Love that the AirPods seat magnetically in the charging case. The sound is as good as regular wired earpods included with your iPhone if not better. I must point out however that I do not have the best hearing and I am by no means an audiophile, so take my opinion on the sound with a grain of salt. I own multiple Apple devices and switching between them with the AirPods has been a breeze with no re-pairing required as is the case with many other bluetooth headphones. I have a love hate with the sleakness of the design. On one hand I love the astetics of the design, but they are very easy to drop and potentially lose—you can however use the "Find my AirPods" feature from your iPhone to locate them if you misplace them. The AirPods will play an increasingly higher tone until you find them. I really wish they had noise cancellation. This is a feature I have come to love on my Bose over-the-ear headphones. I wish they came in black to match my Jet Black iPhone. Not the end of the world, but it would be nice. While activating Siri with a double tap works great, I would like to see more gestures for controlling things like sound. I prefer to not use Siri turn the sound up or down. I would rather be able to slide my finger up or down. Overall I have been more than satisfied with my AirPods and I would purchase them again in the future if features are added giving me a reason to upgrade. If you own an iPhone I highly recommend them. Even better if you own multiply Apple devices as they are great switching between devices. Note: As of early September 2017 AirPods do not work with Apple TV. This feature is coming with the next version of TV OS however later this year. 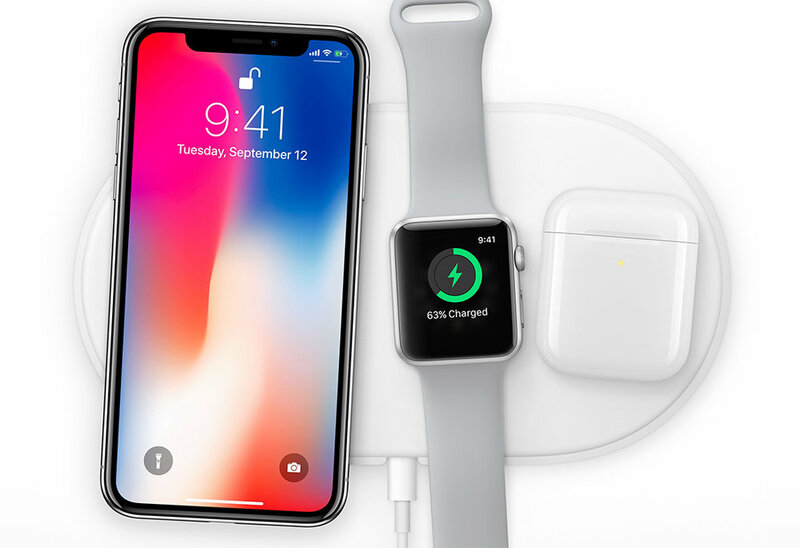 Just as I was posting this Apple showed apparently new (but unannounced) AirPods wirelessly charging on their new AirPower charging mat at their annual new iPhone release event. The new AirPods look the same, but now offer wireless charging like the Apple Watch and the new iPhone 8 and iPhone X (pronounced 10 not X). See below.